The Silver Fox Audit team completed a series of regular audits throughout 2018 to IPSL premises in Northampton, Milton Keynes, Bradford and Camberley. These unannounced audits have been carried out at various times, during the day and night, to test the security teams and IPSL’s own staff. On 8th February Lynda Moore, Managing Partner of FM Contract Watch, presented the 2018 Silver Fox Certificate to Lud Moran, Senior Facilities Manager, at IPSL Northampton. Silver Fox certificates were also awarded to the other IPSL sites. In addition, individual Silver Fox Awards were presented to Security Officers who had been especially vigilant and prevented unauthorised access to their premises. 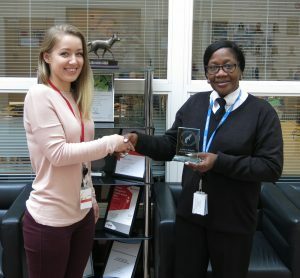 Pearline Morgan was presented an award for her work in Northampton by Alina Protasiewicz, IPSL Facilities and Health & Safety Coordinator. Eddie Stewart from the Northampton contract also received an individual award and Neil Chater and Mendes Afrifa received an individual award for their work at the Milton Keynes premises. We congratulate all of the Security Officers and staff members who prevented our auditors gaining unauthorised access and look forward to continuing to test them during the forthcoming year. Picture: L – R Alina Protasiewicz and Pearline Morgan.